As important economic engines of the Tampa Bay region, freight activity centers are a critical component of the region’s freight transportation network. These centers contribute to the area’s employment base and typically generate intense freight activity. 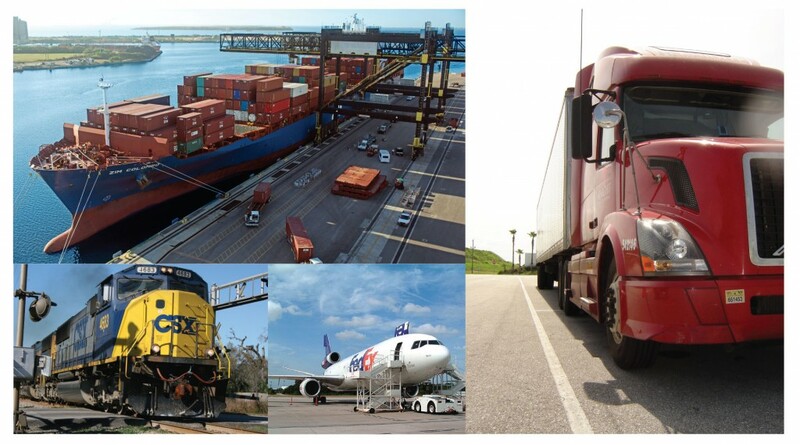 Freight activity centers have been identified throughout the Tampa Bay region to provide context for where industrial and freight logistics activity is prevalent and to define strategies for preserving and improving mobility on the transportation corridors that serve them. While all of the regional freight activity centers generate varying levels of truck traffic, depending on the types of freight activities, many of the centers also have significant transshipment operations supporting multiple modes including freight rail, air cargo, and sea vessels. With some exceptions, most of the region’s FACs have sufficient capacity for expansion and future industrial land use designations that provide for this growth. 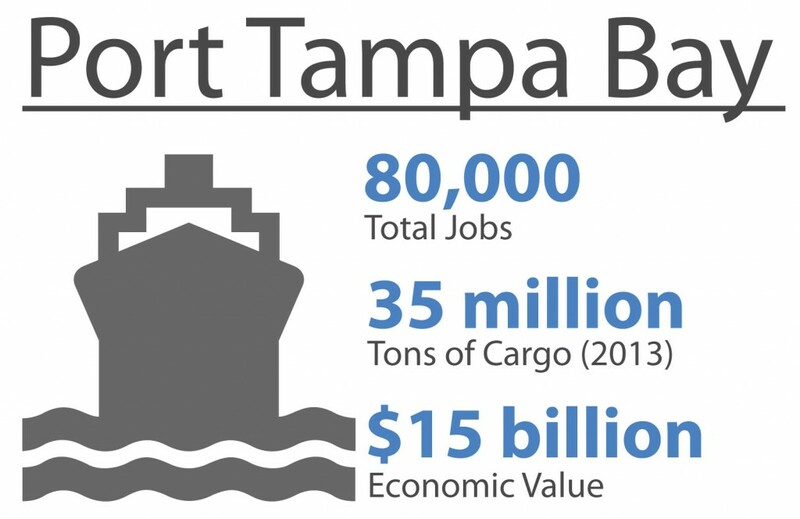 Port Tampa Bay and Port Manatee are the most significant economic generators in the Tampa Bay region. These ports are the region’s principal gateways for goods bound for and arriving from foreign and other domestic producers and markets. These ports have favorable geography as the closest U.S. deepwater seaports to the Panama Canal, and over 50 percent of Florida’s population is within their primary market areas. With nine million residents and 50 million tourists visiting annually within a 100 mile radius, both ports have a large market for expansion and growth. Port Tampa Bay is Florida’s largest deepwater port in terms of tonnage, handling approximately 40 percent of all waterborne commerce passing through the state. In 2010, Port Tampa Bay handled almost 35 million tons of cargo, primarily liquid fuels, fertilizer and other bulk and liquid bulk commodities. The number of containers handled at the port grew significantly from 2003 to 2007 with a subsequent modest decline due to the downturn in the economy. The port has made substantial recent investments to prepare for expanded container business, including the addition of new wharfs, the purchase of several transloading cranes, the expansion of the container yard, and the addition of new rail tracks to facilitate the on-port loading of intermodal trains. Encompassing 5,000 acres, Port Tampa Bay is the largest port in the country in terms of acreage. Much of this land remains undeveloped, positioning the port for expansion in the future. All of these variables position the port for steady, sustainable growth. Port Manatee is another major seaport in Tampa Bay. 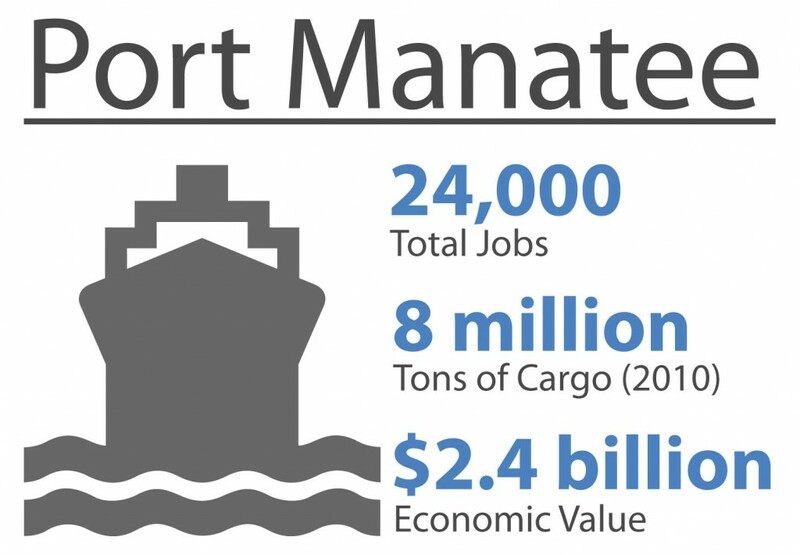 Though not as large as Port Tampa Bay, Port Manatee is expanding rapidly and handles over eight million tons of cargo annually. Major imports and exports traveling through Port Manatee include liquid fuels, cement, forestry products, fertilizer, fruit and juices, natural gas, and automobiles. The Port Manatee Improvement District, which includes the Port Manatee Encouragement Zone, consists of almost 5,000 acres of largely undeveloped land. Extensive incentives for development such as logistically focused manufacturing, processing, warehousing, and distribution facilities are offered to attract port-compatible uses to the area. The tonnage of cargo transported through the Port Tampa Bay and Port Manatee is anticipated to grow in coming years. Both ports have available land to develop new lines of business and expand current operations. Expansion of container trade can be facilitated as both ports are expanding terminal capacity, acquiring new equipment, and streamlining landside access for containerized cargo. However, limited channel depth, the ports’ relatively long distances to North American markets other than the Southeast, major capital improvements at competing ports around the country, and scarce funding resources for infrastructure improvements will temper growth at both Port Manatee and Port Tampa Bay. Nonetheless, the seaports will continue to generate and facilitate high levels of industrial and freight activity and increase the demand for freight roadway, rail, and pipeline capacity in the foreseeable future. Airports provide fast connections between Tampa Bay and distant origins and destinations for certain types of cargo. While relatively low volumes of freight are handled by airports, they provide a critical link in national and international supply chains for time-sensitive, relatively high value cargoes. Major air cargo providers in the Tampa Bay region include Federal Express (FedEx), United Parcel Service (UPS), Flight Express, and the U.S. Postal Service (USPS). The region’s two major cargo airports, Tampa International Airport and St. Petersburg-Clearwater International Airport, handled just over 112,353 total tons of cargo in 2013. Other airports in the region with smaller cargo operations or with the potential for future cargo operations, albeit small in comparison, include Inverness Airport, Hernando County Airport, Zephyrhills Municipal Airport, Tampa Executive Airport, Sarasota-Bradenton International Airport, Lakeland Linder Regional Airport and Bartow Municipal Airport. Most of these airports are adjacent to industrial and warehousing land use clusters that generate substantial truck traffic. While heightened security requirements and rising fuel costs are factors in the air cargo market, moderate growth in air cargo and supporting trucking and freight activity around airports is expected as a result of industrial recruiting and economic development strategies throughout the Tampa Bay region promoting these FACs and providing incentives for their development. CSXT is a private company that serves clients in many of the FACs throughout the Tampa Bay region, and it also operates several rail facilities that generate significant rail and truck freight activity in their own right. The primary intermodal facility is the Uceta Yard south of Broadway Avenue in East Tampa. The CSXT intermodal facility is divided into two rail yards. At the north yard, approximately 85,000 containers are transferred between CSXT rail cars and trucks annually. The south yard is used for bulk transfer and to marshal phosphate and other product-specific trains. Nearby, the CSXT TRANSFLO Yard south of SR 60 is used for intermodal transfer of chemicals, petroleum, and other bulk products from rail to truck. CSXT also operates the Total Distribution Services, Inc. (TDSI) Auto Yard, a 100-acre facility extending along both sides of Sligh Avenue east of Anderson Road and north of Tampa International Airport. 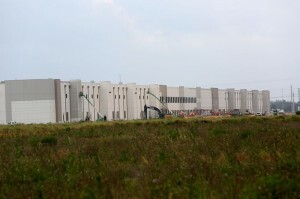 The Auto Yard is a 75-acre facility used to unload new automobiles and has a capacity of 3,600 vehicles. The new automobiles are transported by truck to automobile dealerships throughout the region. The planned Integrated Logistics Center (ILC) in Winter Haven will serve as a centralized transportation and logistics hub for CSXT, providing additional capacity to relocate some of the intermodal activities at the TDSI Auto Yard and a rail to truck transfer facility for consumer goods such as merchandise, food products, and building materials. 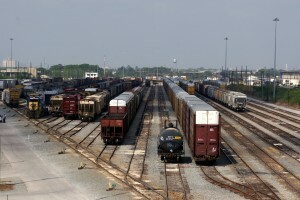 Additional freight rail activity is generated by other CSXT yards. 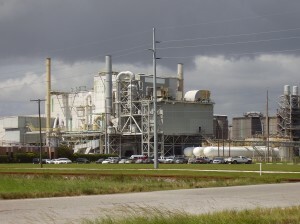 The East Tampa yard, located west of US 41 and north of the Alafia River, serves the Mosaic Company fertilizer plant, delivering bulk phosphate rock and ammonia. The Rockport bulk loading facility, located east of US 41 and south of Causeway Boulevard, is used to transfer bulk phosphate products from trains to ships. Near the Hillsborough County – Pasco County line, the CF Industries Plant City phosphate fertilizer manufacturing plant is served by a rail yard linked to the CSXT Yeoman Subdivision. Manatee County is home to a small CSXT yard located south of the Hillsborough County line that serves Port Manatee. The Tropicana Products plant in Bradenton also has a yard for assembling the transport of juice concentrate to processing plants in the northeast and the Midwest to merchants. There are also several CSXT yards located in Polk County. The Winston Yard in the West Lakeland FAC just to the northeast of the Lakeland Airport serves the phosphate mines to the south and connects to the A-line in Lakeland. In addition to phosphate, general mixed cargo trains are transported through the yard. There are also several CSXT yards in Mulberry in western Polk County associated with the transport of phosphate to the Mosaic Company fertilizer plant between Mulberry and Bartow on the north side of SR 60. Distribution centers are specialized warehouses where goods are stocked for redistribution to retailers, wholesalers, or in some cases, individual customers. These warehouses are critical components of an evolving supply system in which goods are delivered to markets on an as-needed, “just in time” basis, reducing in-store inventories and providing cost efficiencies to retailers and consumers. Distribution centers have emerged as major employment centers throughout central Florida – in the Tampa Bay and Orlando metropolitan areas, and most notably in Polk County and Plant City. Companies such as Advance Auto Parts, Amazon, Best Buy, Haverty’s, Home Depot, JC Penny, Publix, Rooms to Go, Wal-Mart, and many others have located major distribution centers in the area. Extensive additional growth in distribution activity is expected in the Interstate 4 corridor, particularly in Polk County and Plant City. These areas are centrally located to large regional markets and served by high speed, high volume roadways and long haul railroads, providing a high level of accessibility to Florida markets and to the southeastern U.S. The Polk County and Plant City facilities include existing and emerging areas where distribution activities are concentrated and/or are expected to grow. These distribution activities will serve an increasingly important role in streamlining supply chains and ensuring the efficient and affordable delivery of goods to markets throughout the state. The 1.1 million square foot Amazon distribution center. An O’Reilly autoparts distribution center opened in January of 2014 in Lakeland that created 400 new jobs and $40 million in capital investment. O’Reilly is one of the largest specialty retailers of automotive aftermarket parts, tools, supplies, equipment, and accessories in the United States, serving both the do-it-yourself and professional service provider markets. In southern Hillsborough County, Amazon built a 1.1 million square foot distribution center, or “fulfillment center” to fill online orders. The facility opened in September 2014 and created 1,000 new full-time jobs. A major industry that generates significant truck and rail freight traffic in the Tampa Bay region is the mining of rocks and minerals, most notably phosphate and limestone. Mining is land intensive, and once extraction of minerals at various sites has been completed, the land is reclaimed and restored for other useable purposes and new mining areas are identified. Due to these industry characteristics, the mining areas in the region have not been identified as regional freight activity centers. However, mining is one of Florida’s oldest industries and remains a substantial contributor to the state economy as well as a key driver of seaport, rail, and trucking activity in the Tampa Bay region. Phosphate mining occurs in central Florida’s “Bone Valley” region, which includes portions of Polk, Hillsborough, Manatee, Hardee, and DeSoto Counties. Phosphate is a key component of agricultural fertilizers and the region’s primary export. The phosphate is mined and fertilizer is manufactured in proximity to the mines. Approximately 7.2 million tons of phosphate products were shipped through Port Tampa Bay in 2013. A large quantity of finished phosphate and fertilizer products is shipped through both Port Tampa Bay and Port Manatee. Rock quarrying is the primary mining activity in Hernando County, with over 16,000 acres dedicated to or available for that use. The quarries primarily support the construction industry, providing materials such as limestone that are critical to the creation of concrete and asphalt, while some of the soft rocks and minerals extracted (including phosphate) are used in agricultural products.